All Fertilizers Are Not Created Equal. Our hens are fed a high quality diet rich in vitamins and minerals leaving numerous primary and secondary nutrients present in our product. Chick Magic Ag Organic Fertilizer helps to make healthy soil which leads to healthy crops and higher yield. Experience the real value for yourself and try Chick Magic Ag Organic Fertilizer! Chick Magic is derived from pure laying hen manure. LEARN MORE ABOUT CHICK MAGIC AG ORGANIC FERTILIZER! Why CHICK MAGIC AG ORGANIC FERTILIZER? Those using manures must practice sound soil fertility management to prevent nutrient imbalances. Matching the nutrient requirements of crops with the nutrients available in the manure is essential. Raw manure should not be applied directly to vegetable crops. However, dried manure is an excellent fertilizer usually containing primary (N-P-K) and secondary nutrients as well as trace elements, vitamins, and amino acids. The nitrogen in manure is mostly organic which is gradually converted to ammonium and nitrate nitrogen in the soil throughout the growing season. The slow release of nitrogen from manure is perhaps its most important asset. Applied manures also increase microbial populations in the soil. This activity produces compounds that combine with minerals making these elements more available to plant roots. In addition, manures add organic matter to the soil which improves soil structure, aeration, soil moisture-holding capacity and water infiltration. Raw chicken manure is more concentrated than most other animal manures, yet it contains at least 50% water. Having so much water makes it impractical to package and sell. 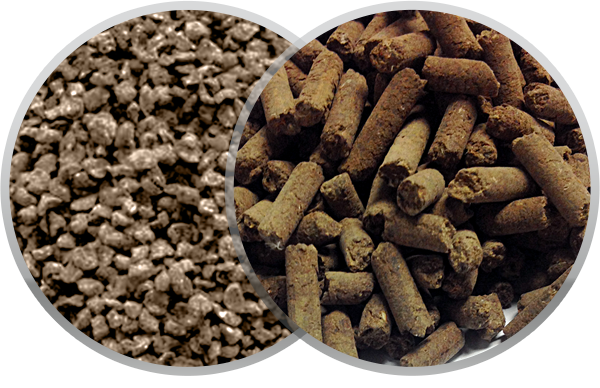 However, when dried, milled, and pelletized, the dense finished product known as processed chicken manure is quite practical with moistures less than 12% and concentrated nutrient values. Chicken manures containing no litter or bedding material have higher nutrient values and better carbon to nitrogen ratios (C/N) which facilitate decomposition of residual organic debris in the field (stover, thatch, etc.). Processed chicken manure is an exceptional value because it contains more primary and secondary nutrients than any other manure. It can also be incorporated into most fertilizer programs. When properly processed, chicken manure can also be approved for organic crop production through the USDA National Organic Program.